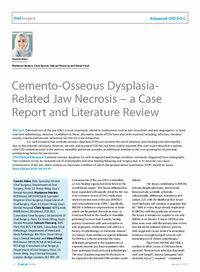 Clinical relevance: Cemento-osseous dysplasia is a well recognized and benign condition commonly diagnosed from radiographs. The condition carries an increased risk of osteomyelitis and slow healing following oral surgery and, at its extreme, can cause osteonecrosis of the jaw, which remains an important condition of which the general dental practitioner (GDP) should be aware. Author notes: Tasnim Atiea, BDS, Specialty Dentist (Oral Surgery), Department of Oral Surgery, Floor 23, Tower Wing, Guy’s Dental Hospital, Marianne Henien, BDS(Hons), MFDS RCS(Ed) Specialist Registrar (Oral Surgery), Department of Oral Surgery, Floor 23, Tower Wing, Guy’s Dental Hospital, Chris Sproat, BDS(Lond), MBBS(Hons), BSc(Hons), FDS RCS, Consultant (Oral Surgery), Department of Oral Surgery, Floor 23, Tower Wing, Guy’s Dental Hospital, Selvam Thavaraj, BDS, PhD, FDS RCS, FRCPath, Consultant (Oral Pathology), Department of Head and Neck Pathology, 4th Floor, Tower Wing, Guy’s Dental Hospital and Vinod Patel, BDS(Hons), MFDS RCS(Ed), MOralSurg RCS(Eng), Consultant (Oral Surgery), Department of Oral Surgery, Floor 23, Tower Wing, Guy’s Dental Hospital, London Bridge, London, SE1 9RT, UK. Objective: To recognize the risk of non-healing associated with cemento-osseous dysplasia following oral surgery.